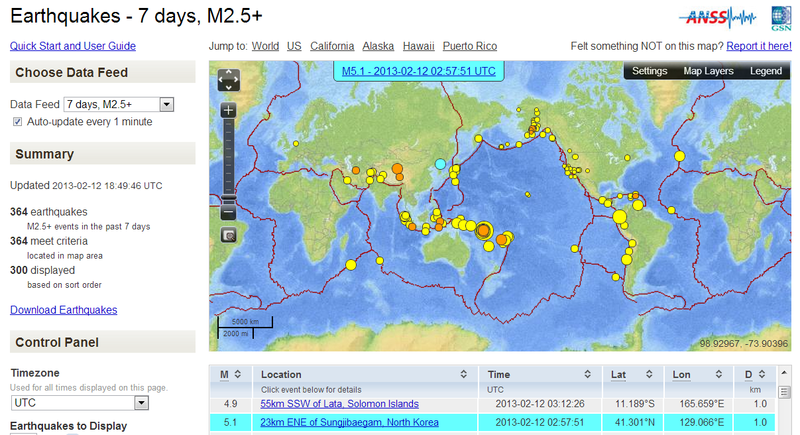 Irresponsible actions from North Korea caused this 5.0 earthquake today. For more information on their nuclear test blast that caused it, you can read this Guardian UK article. Until something more definitive/aggressive (and effective) comes from the United Nations Security Council, I see no reason why further blasts will not be forthcoming from North Korea...they seem to be proceeding with their plans (whatever they are) unabated and undeterred. Otherwise, they (the Security Council) will have no alternative but to accept those consequences (immediate and eventual fallouts), just as they will have to accept today's consequences (as this blast is already a "fait accompli"). Members of the Council should consider the safety of all citizens of this fair planet when making decisions, which should not be based on self-serving gains/ideals. Any members who do not uphold such global safety ideals should not be allowed to be a member and, thus, receive all attendant benefits and privileges. This is my opinion as a concerned citizen of this planet. Bull/Bear Trap Zone on the TF?